The Samsung Galaxy Note 9 is sure to be a very expensive handset, but in order to make the price more palatable it might come with some freebies, as part of a ‘Value Pack’. However, you might get some choice as to what comes with your Note 9, as Reddit user Wan997 claims it will be packaged with a choice of those AKG headphones, a Fortnite gaming package, or both for an extra $99 (around £75/AU$135). Though it sounds like these extras might only be available if you pre-order the phone, and of course even if these leaks are accurate the Value Pack may not be available everywhere. But that’s not the only claim this Reddit user has made. They’ve also said that you’ll be able to buy S Pens individually, so you can pick the color, and that whatever color you choose will be the color of the text when using screen-off memos. Apparently you’ll also be able to get 30 minutes of use from the S Pen with just a 40 second charge, and will be able to use the Pen to switch camera modes with a double tap of a button on it. Speaking of the Note 9’s camera, that will apparently feature new AI technology designed to optimize the settings based on what you’re shooting, and it will show ‘speech bubbles’ that warn you if it detects imperfections in your photo, such as blurriness. 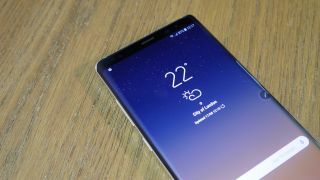 The user goes on to say that the Galaxy Note 9 has a 6.4-inch screen but a very similar footprint to the 6.3-inch Samsung Galaxy Note 8, to the point that the new handset apparently fits in their Note 8 case. And you can apparently use Samsung’s DeX mode (which lets you connect the phone to a monitor and have a more desktop-like experience) simply by hooking it up to an HDMI cable – no dock is needed. You can also apparently take screen-off notes on the Note 9 while in DeX mode. Apparently the Galaxy Watch will also come in a new rose gold color, have 40 workout modes and NFC, but is ditching MST (magnetic secure transmission), meaning it won’t be able to mimic the swiping of a traditional card, so presumably won’t be capable of contactless payments on any machine where a swipe would be necessary. Of course, as with just about everything Note 9 and Galaxy Watch-related this is all just rumors for now, but the phone is landing on August 9 and the Galaxy Watch is probably landing either then or soon after, so we’ll know the truth very soon.